Saito Street: Material: 100% Cr-Mo 4130. Heat- treatment: post weld. Height: 314mm. Steerer tube length: 165mm. Offset: 26mm. Bearing race: Integrated (Campy). Dropouts:5mm thick, laser-cut. Top cap: Aluminum 7075-T6, M25x1.5mm. Weight: 868g. Saito Park: Material: 100% Cr-Mo 4130. Heat- treatment: post weld. Height: 314mm. Steerer tube length: 165mm. Offset: 30mm. Bearing race: Integrated (Campy). Dropouts:4mm thick, laser-cut. Top cap: Aluminum 7075-T6, M25x1.5mm. Weight: 804g. SAITO V.2: Lightweight fork made of triple butted 100% Cr-Mo 4130 steel. Post-weld heat-treated. Molded bottom section of the legs. Steerer tube and legs machined inside for weight reduction. 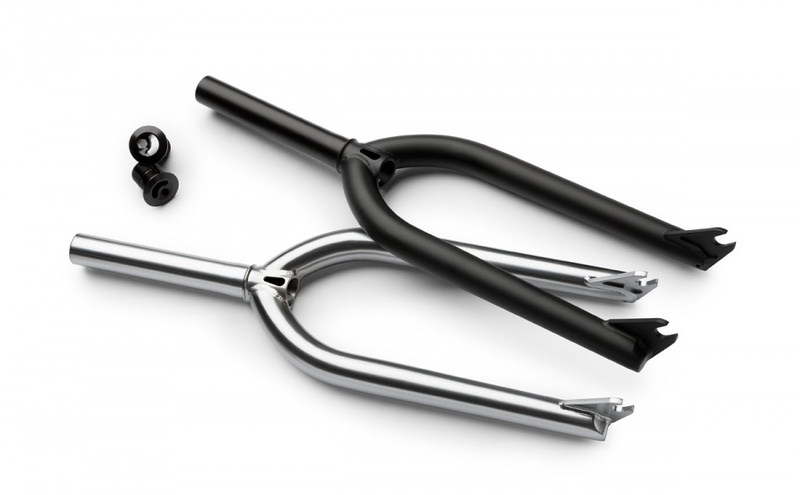 1-pc CNC machined steerer tube.